Our connectors, incorporated in every instrument in the field of electronics, are widely related with people's lives both at home and overseas. Considering the preservation of the global environment as a responsibility of a corporation manufacturing products that are distributed worldwide, we published "Basic Environmental Policies" in 2001. 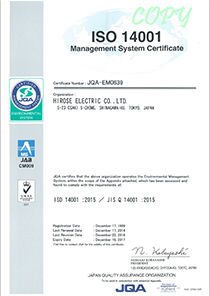 In 2003, for the purpose of enhancing the efforts to realize the said policies, we started to receive international environmental standards (ISO 14001) certification for our company-wide "ISO14001 Integrated Environmental Management System," including the HQ Administrative Division, Sales Division, and Technical Division, instead of having our domestic Group companies (Tohoku Hirose Electric, Ichinoseki Hirose Electric, and Koriyama Hirose Electric) individually receive such certification as we had done until 2003. As is fitting for a company whose slogan is "Creative Links to World Electronics," the Hirose Electric Group recognizes the importance of preserving the global environment as one of the basic business challenges associated with its global ambitions. We will therefore promote corporate activities that give full consideration to conservation of the environment and biodiversity. Connectors, which are our main products, help to save energy because their detachability enhances the users’ productivity and facilitates transportation of their products. They are used in environmentally friendly products, such as electric vehicles and LED lights. Through the utilization of our connectors, we will contribute to the realization of a low-carbon society, preservation of the environment, and conservation of biodiversity. Recognizing that in an endeavor to preserve the environment it is important to adopt environmental management that both is effective and conforms to the relevant environmental management system standards. Hirose Electric and its group companies are committed to conforming to the international standard ISO 14001 and are implementing the following environmental protection activities. 2.1.1. We will ensure that we understand the conditions surrounding our company, the needs of our stakeholders, and the impact of our activities and products on the environment. Based on these findings, we will identify what we must do to protect the environment, ensure that we meet our conformance obligations, and determine the risks and opportunities associated with undertaking such activities. We will promote environmental protection and prevention of pollution by planning and implementing our activities accordingly. 2.1.2. We will comply with environment-related laws, regulations, ordinances, and external requirements that we subscribe to. Promotion of reduction of industrial waste such as metal chips and waste plastic, and promotion of recycling and reuse through segregation. 2.1.4. We will provide in-company training on preservation of the environment and conservation of biodiversity, and raise the awareness of, support, and ask for cooperation from our business partners and clients. 2.1.5. We will continuously improve our environment management system in order to enhance the results that our environmental preservation activities will deliver. Our All factories in the world have been certified according to ISO14001.